This way, it’s like building a pyramid, in that the first level provides the support and stability for the rest of the structure – for instance, if you want bigger shoulders, it makes sense to first build up the strength of the stabilizing muscles around your rotator cuff. Otherwise, you’re likely to find yourself overloading the muscle and causing an injury. When it comes to working out, it’s particularly important you keep hydrated. For instance, the American College of Sports Medicine recommends that you should drink at least twenty ounces of water in the two hours prior to exercise, throughout your workout, and the one most people forget – after your workout, as this is when the body needs to flush out the lactic acid in your muscles. 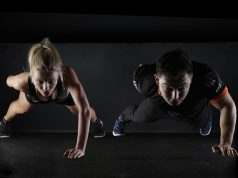 When people think of “core strength” they mostly assume it has to do with their abs, yet, core stability isn’t limited to your abs and back – it extends to all joint structures, for instance, if you develop stability around your knee joints and shoulder joints before lifting heavy weights you are safeguarding yourself against injury. Many people are guilty of binge exercising, trying to cram in so much to a workout that they overdo it. Whilst this can be tempting, it would actually make a lot more sense to do a quick thirty minutes in the morning and a quick thirty minutes in the evening – as this way, your body has time to repair and replenish.